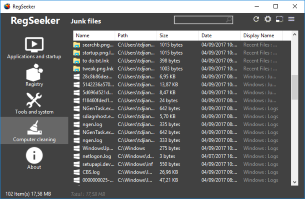 Your all-in-one Toolbox for Windows ! RegSeeker includes some powerful system and registry tools. Take full control of your startup entries, services, drivers, histories, junk files (protect your privacy), installed applications, browsers extensions, and more ! With RegSeeker you'll exactly know what is installed and running on your PC. Easily manage your Startup Entries ! With RegSeeker you can manage what is launched on your PC startup : programs, services, drivers. You can enable/disable startup entries, change services startup type, check for invalid service or delete any item. You can delete any Internet Explorer add-ons (ActiveX, Browser Helper, Extensions) even Chrome extensions ! Clean your Windows Registry ! 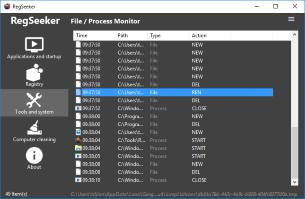 RegSeeker includes a powerful registry cleaner. 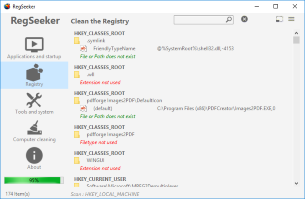 Clean and optimize your Windows registry ! 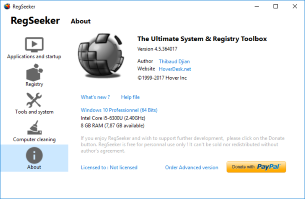 RegSeeker will scan your registry for any wrong or left entries due to programs uninstall. Auto-backup is made before entries deletion. Take care of your privacy ! Keep your PC as clean as it was before your work ! Much more than just a registry cleaner ! RegSeeker includes serveral useful tools. You can search for any items inside your registry, filter any results, search for files (even duplicate ones), tweak your Windows, view process and files changes, repair your essential Windows entries and more ! Discover RegSeeker today to see all its possibilities ! Welcome to the official RegSeeker homepage ! Your all-in-one toolbox for Windows goes to version 4.7 ! Now includes a powerful scripts engine ! Try RegSeeker today and discover how you can clean and speed-up your PC ! Please support further development ! New version 4.7 is available! Several fixes and optimizations. Check the full changelog ! New version 4.50 is available! Huge changes including script engine. Check the full changelog ! New version 4.00 is available! Lots of changes. Check the full changelog ! New version 3.01 is available! Some small fixes. Check the full changelog ! Finally new version 3.0 is available! Many new features and several improvements. Check the full changelog ! New version 2.57 is available! Add Chrome extensions support and other fixes and improvements ! New version 2.55 is available! 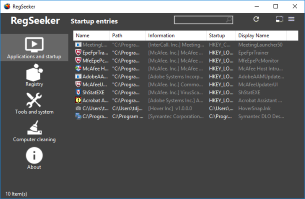 Add missing startup entries for x64, increase Windows 8 support and more ! New version 2.50 is available! Fresh and light new website is now online. RegSeeker is free for personal use only !